In many cultures across the world, the culture of a specific country and the opulent designs in their clothing tends to be epitomized particularly in women's clothing. And Laos is no different in that respect. 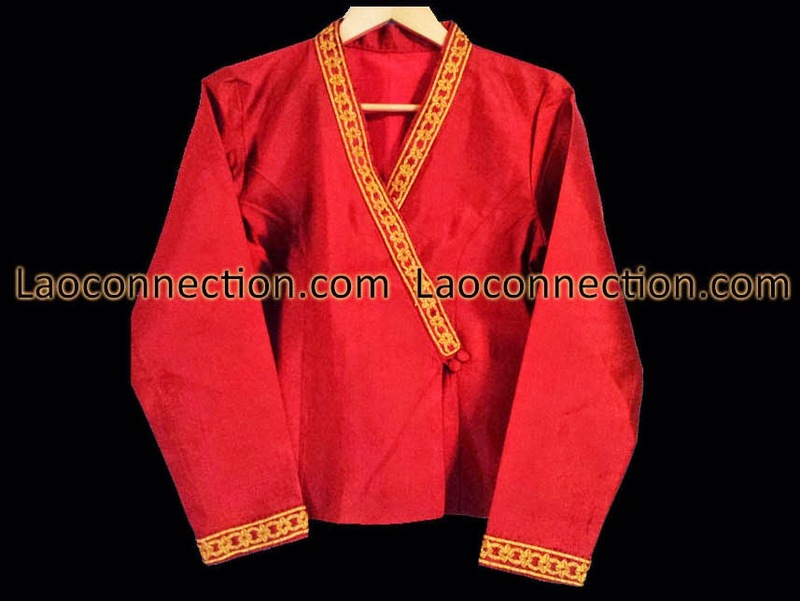 Lao women's clothing such as these shown here are considered a high representation of Lao culture. Textile making is common in Laos but like anything else, not all artisans are of equal talent. 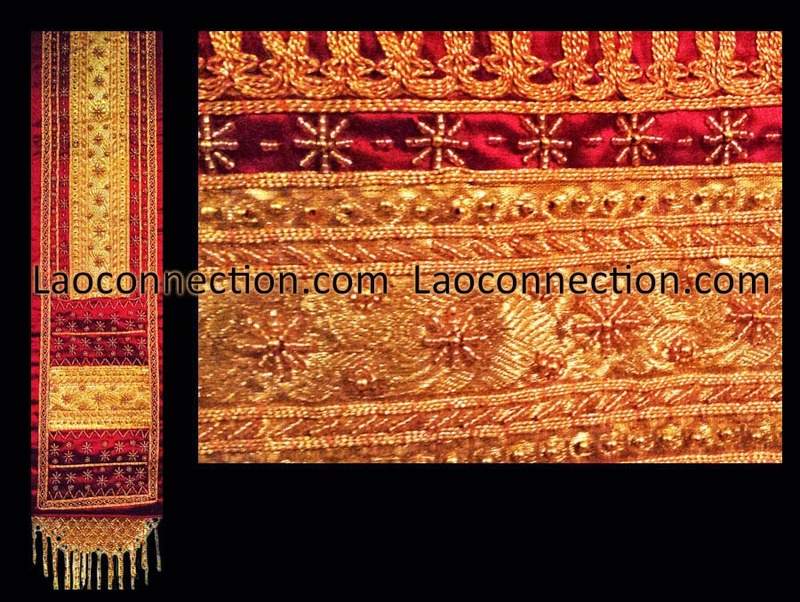 Traditionally, Lao women's wear consists of a shirt jacket (ເສື້ອ), skirt (ຜ້າສີ້ນ) and a scarf/sash (ຜ້າບ່ຽງ). The pa seen (skirt) or ຜ້າສີ້ນ is traditionally worn by most Lao women. There are different variations of it such as ones meant for every day wear versus those worn only on special occasions. They also vary in their material, craftsmanship and quality. Most are made of silk but there are ones made of cotton as well. The one shown below here is one of the more ornately detailed pa seen that would only be worn for a special occasion such as a wedding or ceremony. The one shown here is particular nice. A beautiful and almost regal combination of colors. 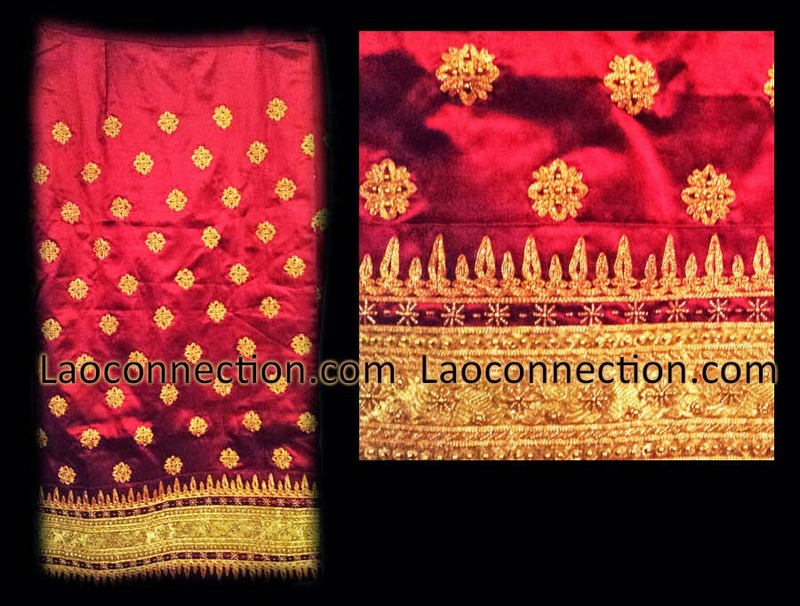 Red wine colored silk with hand embroidered gold thread floral motif pattern. Additionally, the foot or bottom of the skirt is also highly detailed in a thick gold silk pattern with additional trim embroidery. Furthermore, as if all that was not enough, the artisan went further by hand beading gold spheres and cylinders throughout the skirt. Generally, the addition of hand beading is not entirely common. However I was able to find this pair that had it. Click image to enlarge to see further detail. Image on the right is a close-up. The pa bieng (scarf/sash) or ຜ້າບ່ຽງ is traditionally warn over one shoulder and across the chest. It can be pinned together or folded across the body loosely or as firmly as the woman would like. The one shown here below is equally gorgeous and detailed as the the pa seen it was made for a wedding. As a matching pair, the artisan continued similar design patterns and materials for the pa bieng. Again, red wine colored silk with thick heavy gold thread pattern, along with additional hand embroidery and a tremendous amount of hand beading throughout. Wow shared here a very traditional blog on women wears. I really liked the blog and the pictures you have posted here of dress. Thanks and keep sharing with us.